Energytek Corporation is a leading manufacturer of industrial furnaces, ceramics kilns, vacuum furnaces, atmosphere furnaces, electric furnaces, VOC air pollution protection equipment, 1,700° high temperature kilns and automatic controlling equipment in Taiwan. Most of our staff possess many years' practical experience in the area of engineering planning and designing, construction and supervising, trial run and modulation of machinery; covering a wide range of mechanical engineering, combustion control systems, electric heating engineering and automation engineering. 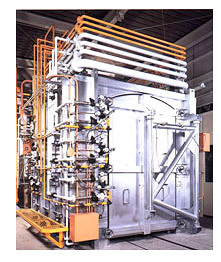 We are engaged in the business of planning, designing, installation, trial run and maintenance of the industrial furnaces, ceramics kilns, vacuum furnaces, atmosphere furnaces, electric furnaces, potter kilns and automatic controlling equipment, and improvement in existed manufacturing equipment. We also accept the commission of authority to solve some problems about fabrication equipment by means of study, planning, designing and consultation of special case.